EWG scientists reviewed Dr. Scholl's Odor Destroyers Sport Spray (old formulation) for safety according to the methodology outlined in our Skin Deep Cosmetics Database. We assess the ingredients listed on the labels of personal care products based on data in toxicity and regulatory databases, government and health agency assessments and the open scientific literature. 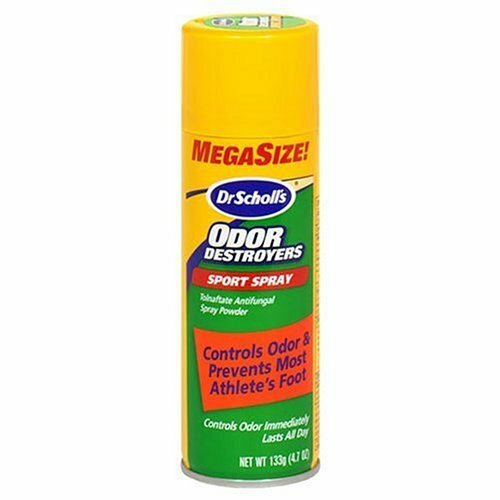 EWG's rating for Dr. Scholl's Odor Destroyers Sport Spray (old formulation) is 7. For prevention of athlete's foot: + wash the feet and dry thoroughly. + shake can well; spray a thin layer on the feet once or twice daily (morning and/or night). + supervise children in the use of this product. + pay special attention to the spaces between toes. + wear well fitting, ventilated shoes. + change shoes and socks at least once a day. In case of clogging, clean nozzle with a pin. Store between 2° and 30°C (36° and 86°F). For external use only. Flammable: Do not use while smoking or near heat or flame. Avoid spraying in eyes. Contents under pressure. Do not puncture or incinerate. Do not store at temperature above 120°F. Use only as directed. Intentional misuse by deliberately concentrating and inhaling the contents can be harmful or fatal. Do not use on children under 2 years of age. Stop use and ask a doctor if irritation occurs. Keep out of the reach of children. If swallowed, get medical help or contact a Poison Control Center right away.